Up until recently I have been using Great News for all my RSS feed reading. The desktop client was plain in many regards but that did not really matter to me as it was fast and allowed me to browse news as fast as possible. I discovered QuiteRSS some time ago and made the switch, and the core reason for that was that the client received regular updates while Great News was virtually dead as it has not received a single update in more than two years. QuiteRSS works surprisingly well out of the box and most users should not have any issues whatsoever with the client right after they have started using it. There are a couple of things that can be improved however, and this guide is about those little things that improve your RSS feed reading further. Lets get started, shall we? QuiteRSS opens articles that you click on in an internal browser by default. I prefer to open news in Firefox instead, my default browser. Not only do I trust Firefox more in regards to security. it is also a lot faster than QuiteRSS in this regard. Once you have made the change, articles that you click on get automatically opened in the selected web browser instead of in the QuiteRSS interface. To make the change select Tools > Options or press F8, and switch to browser when the new window opens up. Here you need to switch from "use embedded browser" to "use external browser" near the top. This loads articles in the default browser automatically. 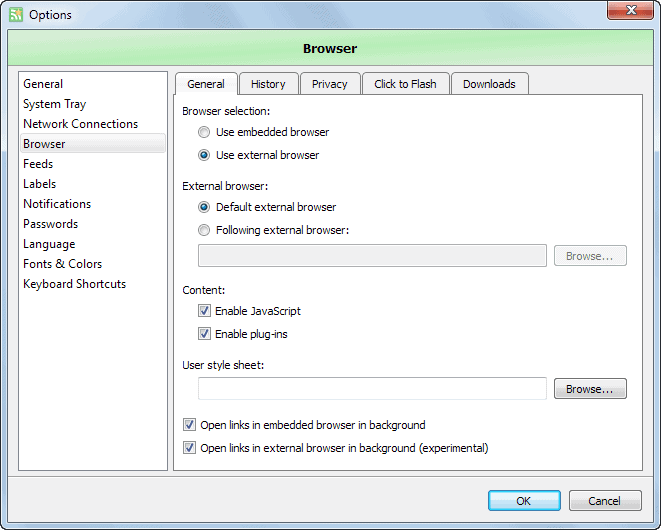 If you prefer to use a different browser instead, or a portable version, add it under external browser in the same window. Links are opened in background by default. You can disable that behavior on the same page by unchecking "open links in external browser in background (experimental). QuiteRSS does not update feeds on startup by default. If you want the program to do that, you need to make another configuration change. 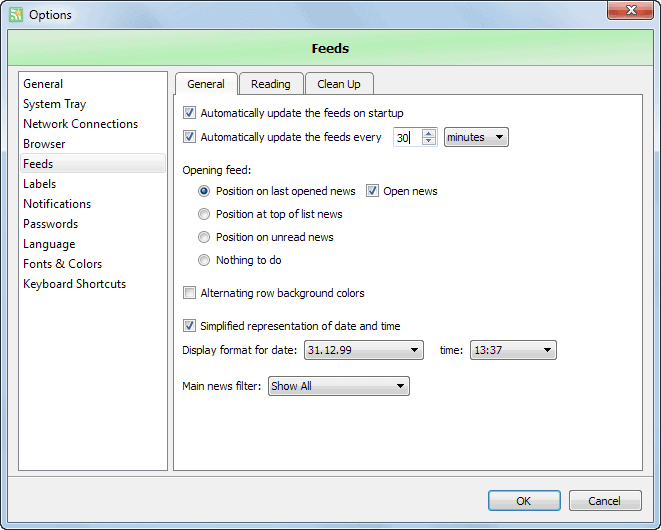 Open Feeds in the options window and check the "automatically update the feeds on startup" preference there. You may also want to check "automatically update the feeds every x minutes/hours" to avoid having to update feeds manually all the time. This is especially useful if you keep your RSS reader open all day long. News are marked read by default when you select them in the interface, or when you click on one of the mark read buttons in the program's toolbars. I'm usually looking at titles only and not all news articles, which means that I have to click on the mark read button all the time to mark all news of a site as read. Select Tools > Options once again. Switch to Feeds > Reading. 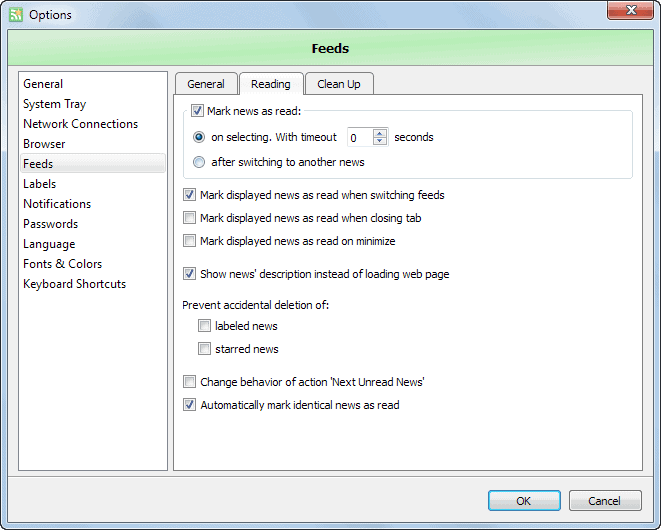 Check the "mark displayed news as read when switching feeds". The notification system is set to play a sound when new news has been downloaded. While this may be useful to some, I find it annoying as I hear that sound multiple times in the hour. That's why I prefer to disable it. You can disable sounds under notifications in the options. Here you can also change the notification settings. I once again do not need to get a notification when new news arrives, as I check the program interface regularly anyway. 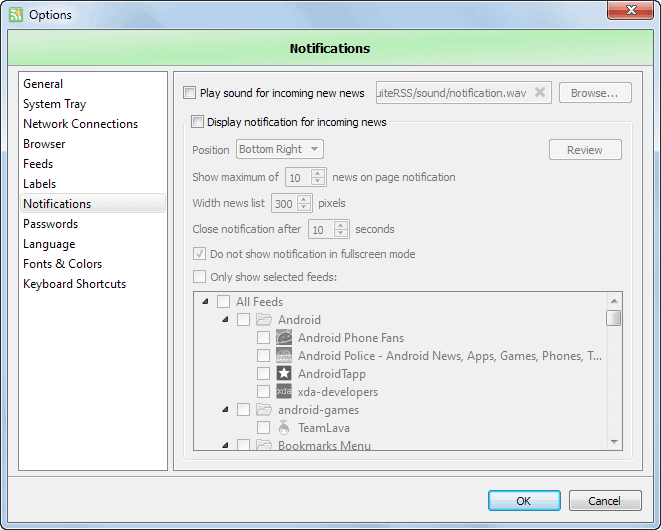 To disable notifications, uncheck the "display notification for incoming news" preference. It is never bad to know a couple of keyboard shortcuts that get you around in a program quicker and faster than any mouse actions can. Here are a couple of important shortcuts for QuiteRSS that you may want to add to your repertoire. You find several other interesting shortcuts under Options > Keyboard Shortcuts. Many are not mapped yet. Examples are sharing options to Google+, Email, Twitter, all labels, Minimize to tray or star news. You can change the font that is used to display the feed and news list in the program. This can be useful if you want a larger font, a different font, or simply different font colors. You can change the settings under Options > Fonts & Colors. QuiteRSS ships with a set of labels that you can use right away. You can however add your own labels as well, for instance to label different projects or research related information differently. 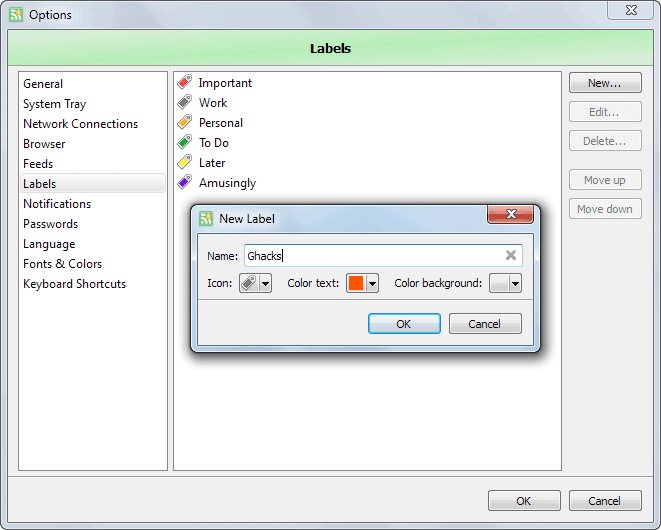 Each label consists of a name, icon, color and background text. The program runs clean up operations regularly and does a good job at that from what I can tell. You may however want to enable the database optimization option on shutdown to speed up the program. It may slow down shutdown though but if you notice slow downs in the application, you may want to enable it to see if it resolves your issues. Never delete unread, starred or labeled news. Thanks, Martin, for the tips. I’m still using RSSOwl for now (at home), but I’m keeping an eye on QuiteRSS as possible switch option too, because I want my RSS client to be lightning fast, and RSSOwl, while rich in functionality, is not that fast. Anyhow the ghacks.net looks clean and tidy now… well done. I wnt receive feed back everytime from RSS. What must I do? I absolutely love quiterss, it stole me away from web readers, something FeedDemon could never do. Everything about it is great, the looks the functionality, the themes blend well with system themes, the portable version from portableapps.com, and best of all ***There is a Linux Version that works just as great***!!! I recently discovered QuiteRSS at portableapps.com and I love it. Stopped using NewzCrawler, which is abandonware. One thing that isn’t apparent and undocumented is that in order to remove a label you need to re-select the same label. The Label dialogue then serves also as a toggle. You can also add more than one label but I don’t know how many. Yet. I found QuiteRSS about two days after the goog made its too-bad-ain’t-it announcement about Reader. I haven’t looked back. This app rocks, the developers are in top gear – it’ll just keep getting better. I will not consider any rss reader before it implements ‘newspaper’ view layout. So I am sticking with RSSOwl for the time being. Great tips! Has anyone figured out how to get QuiteRSS to stay on top when clicking a link? That is, I want it so that when I click a link in a feed it will open the link in my external browser (Chrome) but keep QuiteRSS right where it is so I can keep going through my feeds. That’s probably something that you will have to configure in your window manager, be it KDE, Gnome, XFCE, etc. There might be a way to keep QuiteRSS on top and keep focus unless you click on another window. Its working fine with me except 2 issues, 1 with labels i.e if i want to change its tag the old news will stay there.. i had to delete and create new.But main issue is that we are 3 users working in a shift on 1 computer, and i want all data/feeds/labels to be access and manage by all users(i.e delete or starred). in addition to that i need my stared news to be viewed by my supervisor who is using another PC. Any help with the 2nd issue???? What’s going on with QuiteRSS? As far as I can tell, the most recent version is 0.18.4 and it hasn’t been updated since 3-Aug-2016.